Kumar goes on to consider other high-impact practices and emerging ideas in pedagogy that have the potential for reshaping liberal arts education to better serve a wider population and to tackle complex global challenges. Watch the video and download the linked slides from hari’s presentation below. 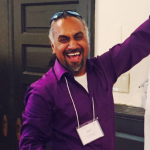 Kumar is Director of Instructional & Curricular Design Services and Associate Director of the Teaching and Learning Collaborative at Amherst College.